Plastik is in the arcade for September! EEE! So excited. It was a dark and stormy night and you just so happened to stumble upon this ghoulishly delightful and dare I say, Ghastly Gatcha… You make your way towards the coin-operated display and are intrigued by it’s contents, not full certain what you may get but you slide a coin into the slot and turn the dial anyways. The machine clicks and clacks, moans and groans and out pops a mysterious item. Could it be the rare and beautiful Cathedral Stand and Books? Or perhaps the mysterious Mothe Shadow Box? Pray tell, was it the Crawl Teapot, with a mind of it’s own? Or did you get your bounce back with the rare and highly sought-after Gothybounce House? Each item is special, and each item is unique, with it’s own wants and desires and the darkness you seek. But the item chooses few so which one will choose you? Did you pique the Crania Jewelry Box’s interest, or the Ouija Mirror? The Deathring Table or the Coffin Rug? Maybe the Eden Candle or the Krall Lantern? 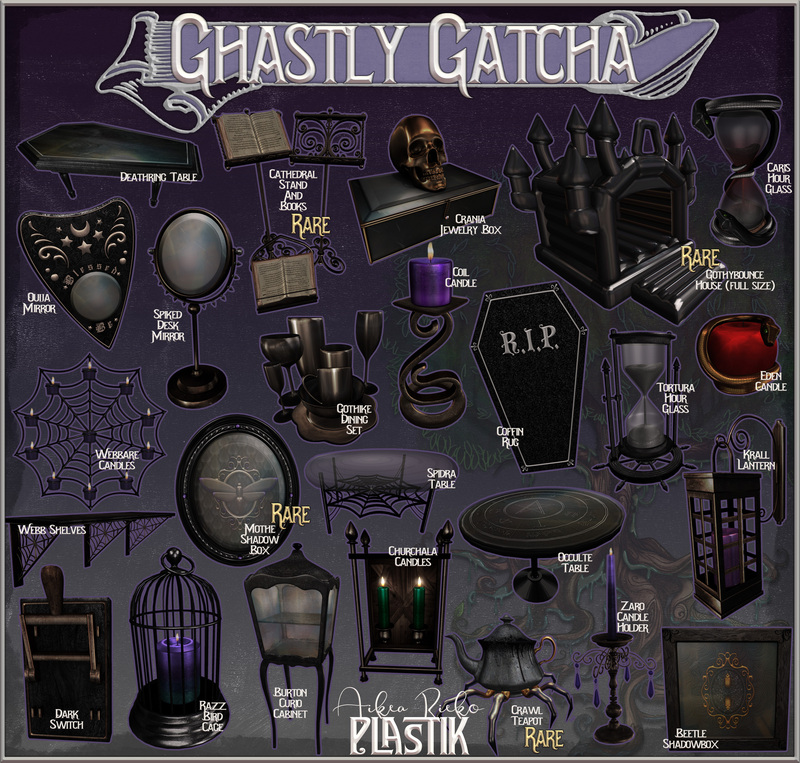 I dare say that any one of these fine specimens would suit you well though I wonder, dear friend, if each one of these trinkets holds your own personal hell… Play the Gatcha if you will and receive one item that will give you chills! Do you fancy something geometrically inspired? Something to give you that edge you were looking for in your home or establishment? Find beauty in the straight and narrow, or delight in the pointy? Do you like symmetry and order or are you more chaotic in your designs? Perhaps these shapes are for you, friend. One can never go wrong with these finely crafted modern pieces. The Leones Wallart, a rare treat, is inspired by the noble lion and given hard edges to suit it’s stoic yet proud nature. The Steps Planter, an homage to both the chaos and order of the labyrinth, with a sprinkling of life with it’s beautiful potted plants. The Epla Table and Chairs will bring serenity and solace to any dining room or kitchen with it’s shapely and sleek build, both solid and strong as well as elegant. Perhaps you are in need of more and who could blame you? The Rhom Light will illuminate the dark corners of your room, and bounce beams of beauty strategically from the Trite Wall Mirror. Perhaps you require a place to store your things and in keeping with the trend might find the Heli Wall useful. I know I do. If practical beauty is your thing then why not pick up the Rory Cloche or Cheve Planter, both splendid additions to any room. 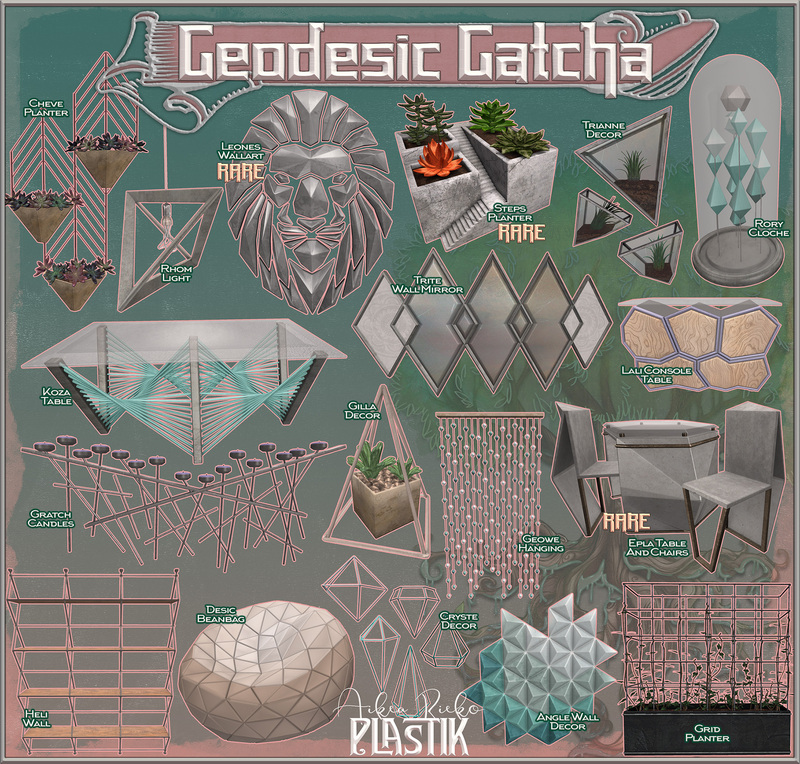 There are no wrong choices, only right angles with the Geodesic Gatcha. ~ by Vae on September 2, 2017.